Unfortunately I don't have enough time for requests. I wouldn't mind if someone else wanted to do that though. Try one of the two comments below. One should fix that. do you have HOTS dependencies ?? Did you import them to their proper place? 9 out of 10 the bright glowing white buggy color happen because misplace the dds and m3. FYI the dds goes to Assets/Textures/ , the m3 goes to default. Hey im lovin your Umojan marine but I import it into the game, reload my map and its just stuck a bright glowing white buggy colour. Very nice Umojan models! I hope sometime in the future you'll consider some Kel-Morian units as well. Currently I'm using the normal marines models with these weapons found here on mapster but it looks awkward for a campaign to have those mixed armors.. 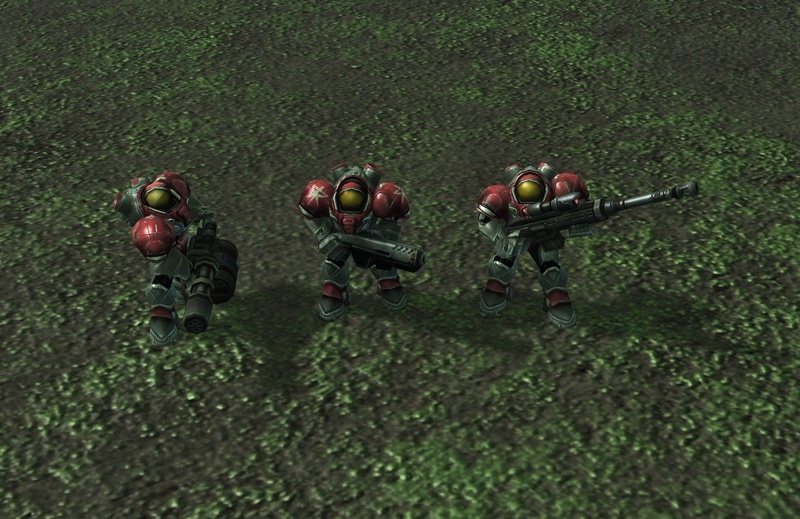 I attached an image of the three marine variants, I'd like to have those three in umojan version. Wow, fast work there. Nice! Don't mean to nag or anything, but Is it possible to make weapon particle and fx of the zerg buster to cover the claws, I notice the particle and fx only cover half of the claws. I never though of it as them being animated I'll have to check it out. Also here are the zerg buster and female zealot redone with particle emitters this time. Still no fix on the red when cloaked because I have no idea what's causing it but I'll find out eventually. I think the main issue with transplanting particles and animated textures (such as is used for Zeratul's Warp Blade) is because they have their own keyframes in their original model so you'd have to figure those out and re-arrange them to match the destination model's animations. Oh also got a bug report: On your BW Firebat the Decal doesn't seem to change properly and stays as the default Terran Decal. Ok, I'll go ask him then, thank you! Just wanted to thank you for the umojan units, I will be using them in my Shadowguard campaign! Special thanks to you! Just one question, are there Icons and wireframes for these already released on the page you linked for it? Conratz on figuring out how to import weapon fx. OK I figured it out guys. There was a texture I forgot for the War decal. Try importing this. Also here's the Black Ops Spectre fixed. classic marine texture missing bug. arms, torso and helmet. May I ask a fix for zerg buster model also? Yeah sorry as you can tell I have a really bad habit of releasing models before I properly test them :D I'm working on a fix for that one right now.